The hotels and business places here are doing a rather brisk trade at present, on account of the large number of extra stomachs – the owners of which are at work on the railway – that require to be filled and satisfied with liquids and solids, chiefly the former, I am sorry to say. The railway is progressing here, but not so satisfactorily to the contractor as he might expect, it being very difficult to obtain steady men. They have started driving the piles of the bridge of 99 arches, each 20 feet span, over the Campaspe, and are cutting through the hill on the Rodney side of the river adjoining Mr. Heffernan’s estate. The hill is composed principally of bluestone, which has to be blasted, and it appears strange that, with an immense quantity of such material at hand, the bridge should rest upon wooden tiles. It is impossible to deny that at the end of twenty or twenty-five years, “the bridge will have become unsafe, whereas the bluestone would have stood for generations. It certainly seems a “penny wise and pound foolish’ policy. A new policeman is about to appear on the scene here, that office having been satisfactorily but temporarily filled by Mr. Myers. The newcomer, poor fellow – l beg your pardon, ladies -had to enter the bonds of wedlock before he could accept the position, as the station can only be occupied by married men. The happy pair will spend their honeymoon here, so we wish them a pleasant one. There is a a local industry being carried on here, which is capable of being largely developed, namely the bluestone quarry, the proprietor of which, Mr. J.Ingham, deserves credit for the perserving manner in which he has worked the quarry under discouraging circumstances. He has raised some immense blocks of stone, one some time back measuring 16ft 6 in. by 12ft by 2ft. There is one at present lying in the quarry measuring 9 by 6 by 2 feet, which is without a flaw, and when struck, rings like a bell. There are many more of the same size and quality in sight. Mr. Ingham, has purchased the engine and stone sawing machine which were used for cutting the stone at the new public buildlings at Sandhurst, and he, therefore, in future intends to supply stone in the finished state. When the railway is completed, he intends to have a tramway connected with the line above Mr. Heffernan’s estate, from the quarry, it having been surveyed and found possible. He will then be able to deliver the stone with expedition, in any quantity, and at a cheap rate, to any part of the colonies. 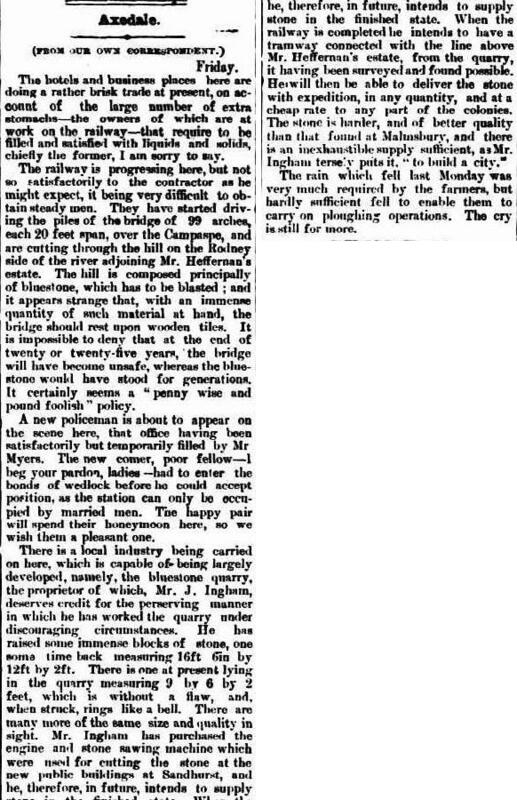 The stone is harder, and of better quality than that found, at Malmsbury, and there is an inexhaustible supply sufficient, as Mr. Ingham, tersely puts it, ‘ to build a city.” ‘The rain which fell last Monday was very much required by the farmers, but hardly sufficient fell to enable them to carry on ploughing operations. The cry is still for more. 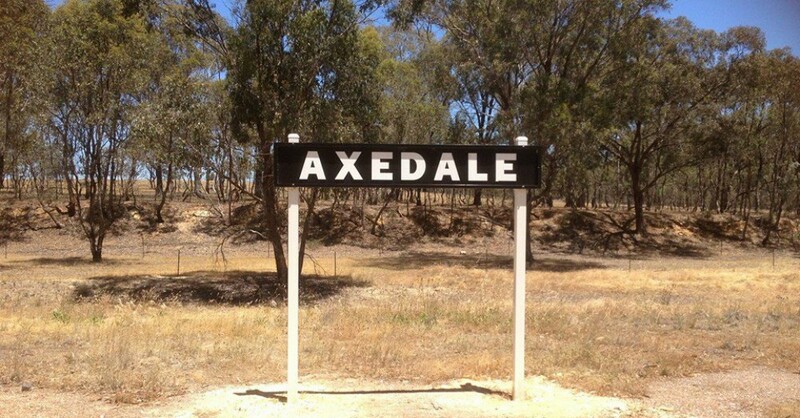 This entry was posted in History and tagged Axedale, History by Jennifer Jones. Bookmark the permalink.